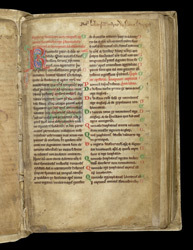 This manuscript has a copy of the 'History of the English' ('Historia Rerum Anglicanum') by William of Newburgh (1136-1198). It was owned by the Augustinian priory at Newburgh where the author was a canon and probably was copied from his rough draft. William wrote history in the tradition of Bede. He tried to connect events and evaluate the characters and actions that brought them about but avoided filling out a narrative with legends like his contemporary Geoffrey of Monmouth, of whom he was scathingly critical. His 'History' covers the reigns of English kings from William the Conqueror to Richard the Lionheart, 1066 to 1198. The 'History' begins with William's letter to Ernaldus, abbot of Rievaulx. In the second column, the list gives the titles of chapters. Above, a 14th-century inscription identifies the manuscript as belonging to "St Mary of Novo Burgo (Newburgh)."